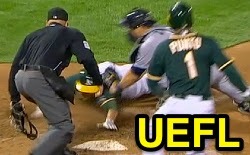 Instant Replay Review confirmed HP Umpire Sean Barber's out (no block) call in the bottom of the 5th inning and 2B Umpire Manny Gonzalez's home run call in the bottom of the 12th inning of the Mariners-Athletics game. In the 5th, with two out and one on, Athletics batter Sam Fuld hit a 2-2 breaking ball from Mariners pitcher Roenis Elias on a line drive to right fielder Logan Morrison, who threw home to second baseman Robinson Cano to catcher Mike Zunino as Fuld arrived at home plate attempting an inside-the-park home run. Upon Instant Replay Review as the result of a request by Athletics Manager Bob Melvin and initiation by crew chief Fieldin Culbreth, Barber's ruling that Zunino tagged Fuld and did not violate Rule 7.13 in allowing Fuld access to home plate until Zunino was in possession of the baseball was affirmed, the call was correct. At the time of the review, the Mariners were leading, 2-1. In the 12th, with none out and none on, A's batter Coco Crisp hit a 0-1 fastball from Mariners pitcher Hector Noesi on the fly to deep right-center field for a home run. Upon Instant Replay Review as the result of a request by Mariners Manager Lloyd McClendon and initiation by Crew Chief Fieldin Culbreth, Gonzalez's ruling that Crisp's drive hit dead ball territory above and beyond the outfield wall before bouncing back onto the playing field, thus rendering Crip's fly a home run, was affirmed, the call was correct. At the time of the review, the Athletics had won the ballgame, 3-2, in 12 innings. This is Sean Barber (29)'s first instant replay challenge/review of 2014. Sean Barber is now 1/1 (1.000 Affirmation Rate) in Instant Replay Reviews during 2014. Manny Gonzalez is now 1/1 (1.00 Affirmation Rate) in Instant Replay Reviews during 2014. Crew Chief Fieldin Culbreth's crew is now 1/1 (1.000 Affirmation Rate) in Replay Reviews during 2014. This is the 21st instant Replay Review of the 2014 MLB Regular Season. A's Manager Bob Melvin is now 0/2 (.000 Success) in Instant Replay Challenges/Requests in 2014. Umpires are now 16/24 (.667 Affirmation) in Instant Replay Reviews during the 2014 MLB season. Instant Replay review confirmed HP Umpire Brian Knight's ball three call in the top of the 9th inning of the Yankees-Astros game. With two out and one on, Yankees batter Yangervis Solarte took a 2-1 slider from Astros pitcher Brad Peacock for a called third ball. Upon Instant Replay Review as the result of initiation by Crew Chief Gerry Davis, Knight's record keeping ruling of a 3-1 count was affirmed, the call was correct. Solarte walked on the next pitch (ball four). At the time of the review, the Yankees were leading, 4-2. The Yankees ultimately won the contest, 4-2. This is Brian Knight (91)'s first instant replay challenge/review of 2014 (he is now 1/1). Crew Chief Gerry Davis' crew is now 1/1 (1.000 Affirmation Rate) in 2014 Replay Reviews. This is the 22nd Instant Replay Review of the 2014 MLB Regular Season. Umpires are now 16/24 (.667 Affirmation Rate) in Replay Reviews during 2014.